Oklahoma City Mayor Mick Cornett’s refusal to debate challenger Ed Shadid in his reelection bid shows he has little respect for the basic democratic process and is most likely afraid he would shred votes if he talks about issues beyond sound bites and advertisements. Ward 2 Councilor Shadid, a local physician, pictured right, has called for the debates among the mayoral candidates, which also include Phil Hughes and Joe B. Sarge Nelson. 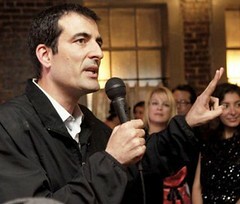 Shadid and Cornett are the frontrunners in the election, scheduled for March 4. Cornett, a former television sports reporter and anchor, has come under fire before from Shadid and others for his secretive approach to city governance, which seems dominated by corporate interests and a fixation on improving downtown and expanding Bricktown for their financial benefit. The losers in this governance style, according to Cornett’s critics, are the city’s numerous neighborhoods and the basic crime safety of its citizens. Cornett has made the claims of secretiveness seem especially valid now that he has refused to debate. In a statement, Cornett said he didn’t want to debate because he is “the only candidate conducting a positive campaign focused on the issues.” Even if that were true, which it isn’t, it’s still not a valid reason to refuse to debate. Shadid has raised issues that challenge Cornett’s narrow, rosy view of the city, and that’s just the point. Oklahoma City residents absolutely deserve to hear the different viewpoints. It’s as if Cornett wants to undermine the basic democratic process because he might get his feelings hurt when someone doesn’t agree with him or, in other words, isn’t “positive” enough about the city’s high crime rate and shortage of police officers. Don’t elections usually pit people against one another because of disagreements? As far as I can tell, Cornett is getting little pushback from the local corporate media about his decision, especially from The Oklahoman, which for all practical purposes is a de facto part of Cornett’s campaign apparatus. At least the newspaper reported Cornett’s decision and extremely weak excuse, but a credible metropolitan newspaper would have immediately pushed for debates. One issue that has come up in the election, and it’s one Cornett probably doesn’t think is “positive,” is the lack of diversity among his appointees to various city boards, commissions and trusts. The Shadid campaign, for example, reports that since 2004 only 22.8 percent of Cornett’s appointees have been women even though they outnumber men in Oklahoma City 51 to 49 percent. The campaign also notes that out of the 1,117 appointments, only 35 have been African American, only 13 have been Hispanic American and only one has been Asian American. For anyone who believes in basic fairness and diversity, this isn’t “positive” news at all, of course, but it IS an issue that should be debated. The question, then, becomes whether Cornett believes you have to hold narrow and archaic views here in central Oklahoma to be considered “positive.” If you believe in diversity, women’s rights and equality, then that isn’t “positive,” right? The bottom line is that, for now, Cornett is making a calculated political decision not to debate, banking that his name recognition, his incumbency and ultra-conservative views will assure him victory. That’s a strategy that can work well in a statewide or Congressional election here in Oklahoma, but it could clearly backfire in a low turnout city election. « So What Are Dorman's Chances?